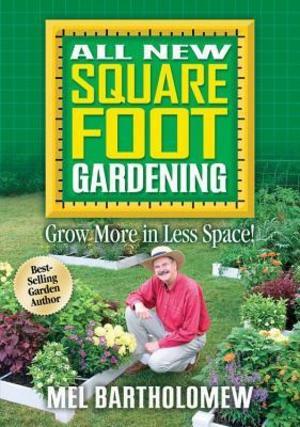 Do you know what the best feature is in All New Square Foot Gardening? Sure, there are ten new features in this all-new, updated book. Sure, it's even simpler than it was before. Of course, you don't have to worry about fertilizer or poor soil ever again because you'll be growing above the ground. But, the best feature is that "anyone," "anywhere" can enjoy a Square Foot garden. Children, adults with limited mobility, even complete novices can achieve spectacular results. But, let's get back to the ten improvements. You're going to love them. 1) New Location - Move your garden closer to your house by eliminating single-row gardening. Square Foot Garden needs just "twenty percent" of the space of a traditional garden. 2) New Direction - Locate your garden "on top" of existing soil. Forget about pH soil tests, double-digging (who enjoys that? ), or the never-ending soil improvements. 3) New Soil - The new "Mel's Mix" is the perfect growing mix. Why, we even give you the recipe. Best of all, you can even "buy" the different types of compost needed. 4) New Depth - You only need to prepare a SFG box to a depth of 6 inches! It's true--the majority of plants develop just fine when grown at this depth. 5) No Fertilizer - The all new SFG does not need any fertilizer-ever! If you start with the perfect soil mix, then you don't need to add fertilizer. 6) New Boxes - The new method uses bottomless boxes placed aboveground. We show you how to build your own (with step-by-step photos). 7) New Aisles - The ideal gardening aisle width is about three to four feet. That makes it even easier to kneel, work, and harvest. 8) New Grids - Prominent and permanent grids added to your SFG box help you visualize the planting squares and know how to space for maximum harvest. 9) New Seed Saving Idea - The old-fashioned way advocates planting many seeds and then thinning the extras (that means pulling them up). The new method means planting a pinch- literally two or three seeds--per planting hole. 10) Tabletop Gardens - The new boxes are so much smaller and lighter (only 6 inches of soil, remember? ), you can add a plywood bottom to make them portable. Of course, that's not all. We've also included simple, easy-to-follow instructions using lots of photos and illustrations. You're going to love it!